මේ හදලා තියෙන්නේ Google සමාගමේ නිර්මාණයක් විදියට.සරලව කියනවා නම් මේකේ නම Google Input Tools.මගේ යාලුවෙක් මේ ගැන ඇහුවා මගෙන්.ඒ නිසා මේ ගැන ලියන්න හිතුවේ.සේරටම කලින් software එක බාගන්නකො, එතනින් පස්සේ බලමු ඉතුරු ටික.software එක බාගන්න google image එක click කරන්න. ඊටපස්සේ සාමාන්‍ය විදියට install කරගන්න.install කරලා ඉවර උනාට පස්සේ windows key + space press කරන්න .පහල රූපේ විදියට screen එකේ දකුණු පැත්තේ පෙන්නයි ජනෙල් 8 දි.7 වලදී task bar එකේ පෙන්නන්නේ.දැනට ඔයාගේ com එකේ සිංහල language එකක් විදියට දීලා නැත්තන් select කරන්න තියෙන්නේ දෙකයි. දැන් ඉතින් වැඩේ ඉවරයි වගේ තමයි, වැඩේ වෙන විදිය check කරගන්න පහල විදියට කරන්න. 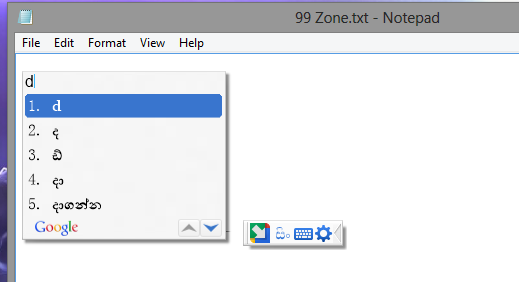 මුලින්ම notepad, MS WORD වගේ typing app එකක් open කරගන්න, දැන් මොකක් හරි type කරන්න, පහල රූපේ වගේ suggetion දෙයි, google database එක ගැන අමුතුවෙන් කියන්න ඕන නැහැනේ, ඕනේ සිංහල වචනයක් කිසි ගේමක් නැතුව type කරන්න පුළුවන්. ඒ හැම වචනෙකටම අනිවා suggetion දෙනවා.ඒ වගේම settings bar එකෙන් ආයෙත් english වලට change කරගන්න පුළුවන්, මිට අමතරව සිංහල keybord එකත් තියනවා, ඒක on කරගන්න settings bar එකේ keybord icon එක click කරන්න. දැන් ඉතින් වැඩේ හරි. facebook, twitter වගේ ඕනෑම තැනක ගේමක් නැතුව වැඩ.මේ ඔයා කියවන පොස්ට් එක type කරෙත් ඒකෙන්ම තමයි. 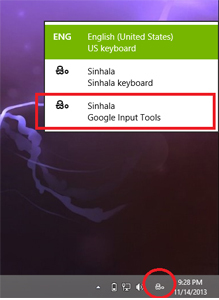 This entry was posted in Software and tagged google, input tools, sinhala, windows 8 by dhanush_c. Bookmark the permalink.